Today we will be showing you how to remove air from your heating system. The first thing you want to do is turn the boiler off. You can turn it off with the switch on the boiler/ furnace or the switch at the top of your stairs. Next you will want to locate and shut off the valves on the return side of your heating loops. There will be one valve for each zone in your house. We are shutting them so we can isolate the heating loops from the boiler. Once we have those valves shut we can grab a garden hose and start it by hand on the boiler drain on the first floor zone. Be sure that the hose has the washer inside to ensure it will not leak. Once we have it tightened as much as we can by hand we can use a pair of channel lock pliers and snug it down. Now that we have the valves shut and the hose connected we can locate the other side of the first floor zone with the zone valve on it. Next we are going to open the zone valve manually. To do this well need to move the bar from the auto/ closed position to manual/ open position. That will allow the water to pass though the zone valve. With the zone valve open we can go back to the other side of the zone and open the boiler drain. Once we open that boiler drain it will allow the boil feed valve/ regulator to put water into the boiler and let it go though the first floor heating loop pushing the air and water out the hose. When you have it open watch the end of the hose to see when you stop getting air. It will take some time. The water at first will be cool but will get REALLY HOT once you have pulled the water from the boiler all the way though the heating loop. So be careful. 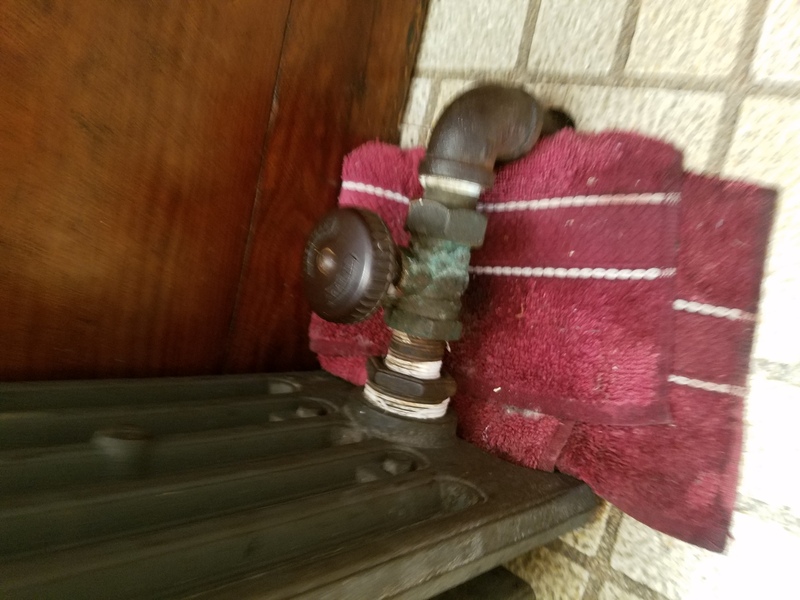 Once we have all the air out of the that loop we can shut that boiler drain off and then shut the first floor zone valve by moving it back to the auto position. That’s it for the first floor zone. Repeat the process for each zone in your house. This is a two zone system so we will move the hose to the second floor boiler drain and then open the second floor zone valve. Next open the second floor boiler drain so the water can go though the second floor and out the hose. With a second or third floor zone there might not be enough pressure to push the air out of the system. So we can lift the tab on the boil feed valve/ regulator to give it full pressure to help push the air out of the line. Be sure to flip the tab back on the boiler feed valve FIRST and then shut the boiler drain. Well let the second floor run watching the end of the hose to ensure we got all the air out of the loop. Once we have gotten all the air out of the loop we can flip the tab on the feeder valve back down and then shut the boiler drain valve and then the second floor zone valve. With the second floor zone valve closed we can now disconnect the hose. It’s a good idea to have a bucket to catch water as gravity will bring you some water. Now that we have the hose removed we can now turn on the valves for each zone/ heating loop so that way the water can make a complete loop though the whole system. Now that we have all the valves back on for each zone we can now turn the boiler/ furnace back on by flipping the switch on the side of the boiler or at the top of the stairs. With the switch back on for the boiler that’s it we have just showed you how to remove air from your heating system. Hello, Well you will need to locate the drain valve so you can hook up a hose to drain the system. If you could get a picture or two of the furnace/ boiler I could give you a better idea where to hook it to. Also do those heaters have the air bleeders on top of them? My temperature goes up on my boiler furnace what can I Do to fix the problem. Not sure I understand what your trying to say. That the temp goes over what you think it should be at? Or the temp is going to high and causing the blow off valve to go off. Most of the time there is a box where you can set your low and high limits. In the video at 0.14 you can see the gray box right at the bottom of the video. I believe this one is a honey well brand. Setting the low limit will be where the boiler turns on and starts heating the water and setting the high limit where be where the boiler shuts off at max temp. Most of the time these are set 160 for the low and 180 for the high. They should have 20 degrees between them where ever you choose to set them. Its normal for the temp to rise a bit above the set temp when the boiler shuts off. You may also want to double check the gauge to ensure its correct. If its adjusted right you may need to replace the Aquastat. Hello, First thing would be to make sure you have enough water in the boiler. Should be 12-15 psi check the gauge although not always accurate. You shouldn’t hear the water as it goes though the zones. I believe on those you could just replace just the probe part of it at about 1/3 of the price of a new unit but depending on the age of the unit and if it has any corrosion in side of it you might want to replace the entire unit. Sometimes you can remove and clean the probe as well and it will solve the problem. It is a safety item and I know in my area and a bunch of surrounding area’s close to me its actually require by code. Hope this helps point you in the right direction/ course of action. Thanks for watching and taking the time to leave us a comment/ question. Good luck with getting it repaired and back up and running.